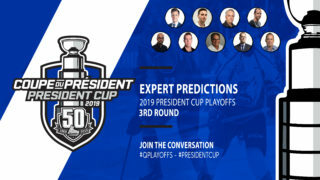 The Drummondville Voltigeurs continued their pursuit of a President Cup championship during the holiday trade period by bolstering their back end. General manager Stéphane Desroches was the Central Division’s biggest buyer, acquiring defencemen Pierre-Olivier Joseph, Michal Ivan and Hugo Savinsky, along with goaltender Anthony Morrone. Joseph, acquired from Charlottetown for two players and three draft picks, brings size and skill to the blueline. 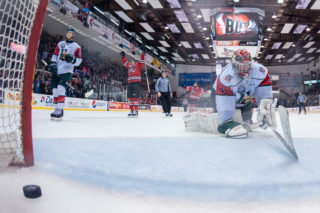 Ivan offers championship experience from last season with Acadie-Bathurst, the latter which received Austrian rearguard Oliver Turan and a 2020 draft pick from Drummondville in the trade. Savinsky came over from Baie-Comeau, while Morrone made his way from Quebec. The front-running Voltigeurs also added experience up front by acquiring veteran centreman Rémy Anglehart from Blainville-Boisbriand in exchange for rookie forward Benjamin Corbeil and draft picks going each way. Anglehart helped the Armada reach last year’s President Cup final. Drummondville also sent two players to Saint John for the rights to current Boston University (NCAA) forward Shane Bowers. The Colorado Avalanche prospect returned to the Terriers after playing for Team Canada at this year’s IIHF World Junior Championship. One of Desroches’ most important upgrades came when he landed veteran forward Gregor MacLeod in a trade with Quebec back in September. 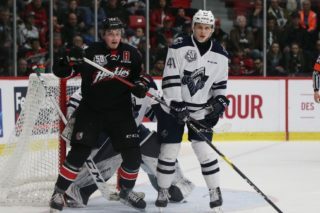 The overager from Dartmouth, N.S., is one of Drummondville’s top scorers and boasts playoff experience acquired with both the Remparts and Islanders. Joseph and fellow Voltigeurs rearguard Nicolas Beaudin were both cut from Team Canada’s World Juniors squad. Forwards Joseph Veleno and Maxime Comtois made the grade, but both came home without a medal. A league championship could serve as redemption for all of the above. While Drummondville is aiming for its first league title since 2009, the Shawinigan Cataractes are building for the future. It’s a familiar scenario for general manager Martin Mondou, who’s seen the approach work before. With Mondou at the helm, the Cataractes won the 2012 Memorial Cup and were QMJHL finalists in 2009 and 2016. Mondou believes that process begins on the blueline, which is why he acquired a trio of towering 17-year-old defencemen. Shawinigan received Pierre-Olivier Bourgeois from Rouyn-Noranda for third- and fifth-round draft picks in 2019, along with Marc-Antoine Pépin from Sherbrooke in exchange for a 2020 10th-rounder, and Felix Tremblay from Quebec for a fourth-round draft pick in 2019. Earlier in the season, the Cataractes also picked up 18-year-old blueliner Benjamin Thibeault from Victoriaville, with a 2021 draft pick going to the Tigres, while goaltender Justin Blanchette came courtesy of Baie-Comeau for fellow netminder Lucas Fitzpatrick over the holidays. In addition, Shawinigan added 19-year-old forward Mikael Robidoux from Quebec for a 2021 fourth-rounder. Robidoux had three goals in his first seven games with the Cataractes. 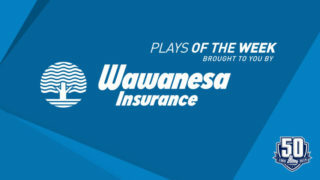 With Drummondville at the top of the division and Shawinigan at the bottom, the in-between teams also made moves in hopes of finishing strong. Second-place Sherbrooke acquired overage defenceman Michael Kemp from Blainville-Boisbriand, with 20-year-old goalie Brendan Cregan going to the Armada. That move cleared the way for Sherbrooke to trade two draft picks to Charlottetown for netminder Dakota Lund-Cornish. The Phoenix also picked up two draft picks by dealing third-year forward Edouard St-Laurent to the Remparts. Third-place Victoriaville picked up veteran forward Olivier Mathieu from Quebec for defenceman Adam Gaudreau and a 2019 second-round pick. Mathieu has paid early dividends, notching four goals in his first six contests with the Tigres. 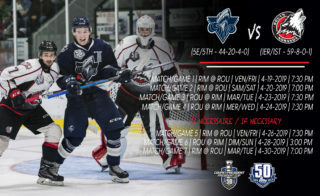 Victoriaville also acquired defenceman Mederick Racicot and a 2020 pick from Val-d’Or for two draft picks, along with forward Anthony Poulin from the Armada for a 2019 pick. In addition, the Tigres obtained a 2020 first-round draft pick and 16-year-old forward Nicolas Daigle from Rimouski for 2017 Calgary Flames draft pick D’Artagnan Joly. The first part of the deal saw Baie-Comeau move Joly to Victoriaville for 19-year-olds Marc-Antoine Brouillette and Mathieu Charlebois, with two draft picks going to each club. Daigle is enjoying a fine offensive season in Quebec’s midget AAA ranks with the Lévis Chevaliers. 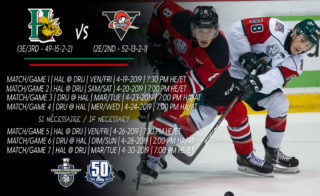 It will now be interesting to see if any team from the Central Division will be able to catch up to the Voltigeurs over the second half of the QMJHL regular season. *Click here to see all transactions.